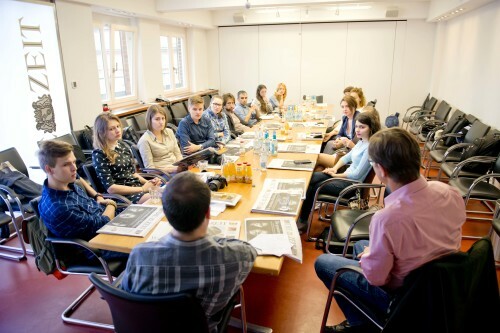 One of the biggest online and print weekly newspapers in Germany Die Zeit gladly opened its door to young journalists from Eastern Europe, who studying at Interlink Academy School in Hamburg. Interlink Academy participants listen to Martin Klingst, a senior political correspondent at Die Zeit. Germany’s most widely read newspaper had a weekly print run of 500,000 copies in 2015, but its estimated circulation, i.e. number of readers, is considerably higher – up to 2 million – because the issue is often passed from hand to hand. Die Zeit‘s main product is a weekly newspaper that covers politics and economics, including investigative reports, social issues, science, literature and culture, travel, and education. It concentrates mostly on features, not news stories, because in a weekly newspaper in this digital age, the news would already be old by the time it was published . The Lifestyle desk publishes its stories in form of a magazine that comes with the weekly paper. A cover page is chosen from among the best features, and in Issue no. 34, this was a story about women in Nigeria who had been kidnapped by the Boko Haram terrorist organization. Die Zeit, German for ‘The Times’, has two offices – one in Berlin and the other in the port city of Hamburg. Its print publishing offices are located in downtown Hamburg, are cozy and modern, because Die Zeit only moved here a few years ago, after previously sharing a building with other media. The publishing house looks as modern as an IT company, with private rooms for investigative and political journalists, small open spaces, lounges, and kitchens. In 1990, the publishing house faced a crisis: subscriptions were down, and many local newspapers were forced to close. One important chapter in the paper’s history ended with the death of its longest-serving editor-in-chief, Marion Dönhoff. For more than 55 years she worked as an editor and later publisher, increasing the newspaper’s popularity and circulation. 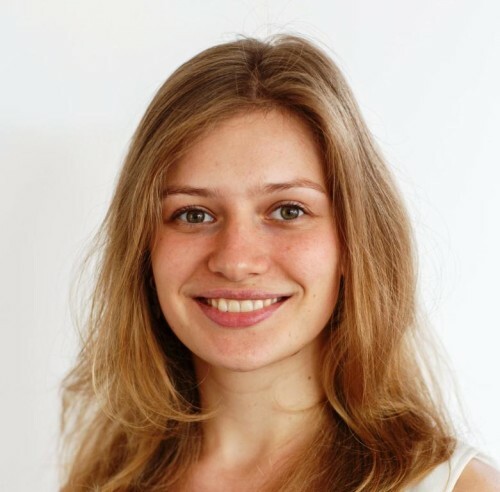 Dönhoff’s ancestral roots were in Königsberg, present-day Kaliningrad in Russia, causing her to have a deep interest in Eastern Europe topics. Die Zeit is making every effort to keep pace with the digital era and move with the times. 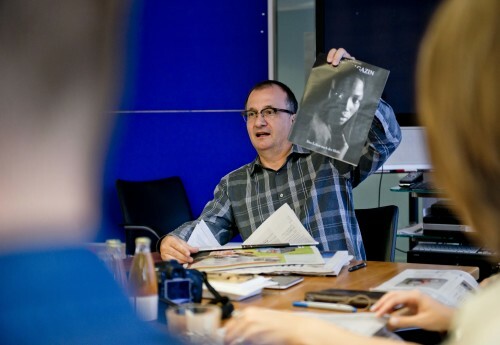 But the team notes that even now, the printed issues of its German national newspaper are what brings in the money: The online subscription is cheaper than the print version. Martin Klingst, a senior political correspondent for Die Zeit, is among those who work for both the Hamburg publishing house and the one in Berlin, writing for both the online and print versions. On Tuesday and Wednesday, when the print version of the newspaper is produced, he comes to the port city. He explains that the online and print content is not as similar as one might think. “What you read online is not the same as the print version,” he says. He emphasizes that more stories are always needed for online, but print journalists are against simply duplicating their stories in digital. Klingst says that while online is the future, publishers still have to invest in a print as well. “Print is a declining, and online a growing business,” he says. “Die Zeit is a brand, and a paper that appeals to the more highly educated sector of the population,” he adds. Accordingly, the publisher produces a lot of science magazines, as well as publishing a travel magazine and operating a travel agency. Another branch of Die Zeit‘s business involves lectures on specific topics given at universities by famous lawyers, scientists, politicians. Die Zeit publishes two separate issues of its paper for Germany’s Western and Eastern federal states, and has developed special sections for Austria, Switzerland, and – most recently – for the city of Hamburg.